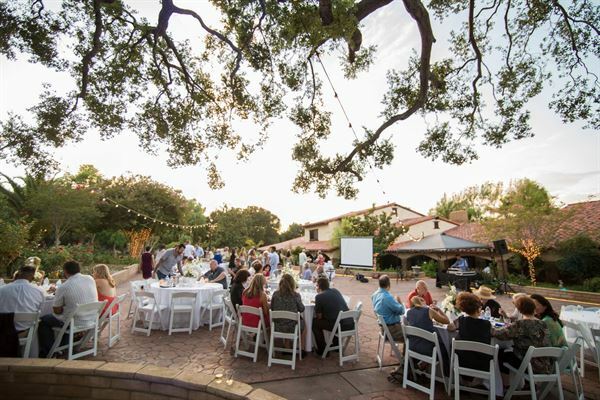 In addition to weddings, anniversaries, and other social events, Vineyard Hacienda is an ideal location for corporate, school, church, non-profit, and other organizations to hold part- or full-day staff development, team-building, leadership, goal-setting, strategy, conference, or other such activities away from normal office or institutional distractions. Vineyard Hacienda is a convenient, accessible, comfortable, and private getaway that will allow for maximum concentration in a relaxed and beautiful setting. The estate itself has a large “family room” that can accommodate up to 100 attendees for large group sessions, and the adjacent cabana (pool house) can accommodate up to 100+. Additionally, there are numerous unique “break-out” locations on the property for smaller groups of attendees, both inside and outside of the hacienda. Indoor locations include: the distinctive two-level underground wine cellar, the family room (with fireplace), the library (with fireplace), the living room, the formal dining room, and the breakfast nook (with fireplace), and the cabana. Wi-Fi is available throughout the estate and in many outside locations on the property. Outdoors, there are numerous comfortable and protected spots as well: under the gazebo overlooking the koi pond, by the swimming pool, several places under the wraparound awning of the hacienda, under various large oak and palm trees throughout the property, and in the two orchards. All packages include: Venue coordinator, setup, breakdown, tables, chairs, linens, bartender, basic lighting, dance floor, all 6 rooms per night, security, parking assistants, and cleaning staff. Diamond Package | $29,000 + applicable tax & fee • Three Days and three nights, all-inclusive wedding planning services for: Rehearsal Dinner, Ceremony & Reception, Celebratory Sunday(pool party, champagne, catering, and music for up to 100 people from noon until dusk). • Vineyard Hacienda takes care of entire setup for all three days: catering, floral, DJ, photographer, and all six rooms per night at our exquisite hideaway. Platinum Package | $24,000 + applicable tax & fees • Two Days, two nights, all-inclusive wedding planning services for: Rehearsal Dinner, Ceremony & Reception • Vineyard Hacienda takes care of entire setup for both days; catering, floral, DJ, photographer, and all six rooms per night at our exquisite hideaway. Gold Package | $20,000 + applicable tax + fee • One Day and one night stay, all-inclusive wedding planning services for: Ceremony & Reception • Vineyard Hacienda takes care of entire setup for the entire day; catering, floral, DJ, photographer, and all six rooms for one night at our exquisite hideaway. Silver Package | $16,000 +applicable tax + fee • Two Days and two nights: Rehearsal Dinner, Ceremony & Reception and all six rooms for two nights at our exquisite hideaway. Bronze Package | $13,000 + applicable tax + fee • One Day and overnight stay. Ceremony & Reception Events and all six rooms for a night at our exquisite hideaway. All package prices are for a 100 people or less. There is an additional $50/person charge that applies thereafter. Maximum capacity of 200 people per event. Maximum capacity of three people per room for overnight stay. Loud music of events end at 10 p.m.